This is a photo of the Springfield V-10 pistol. 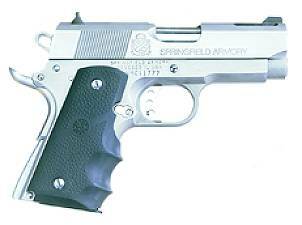 The handgun was manufactured by Springfield Armory. The gun is designed for concealed carry: it is chopped on the grip and the slide, has an extended beavertail and heavy porting in the barrel. The gun was chambered for the .45 ACP. It is not manufactured anymore.